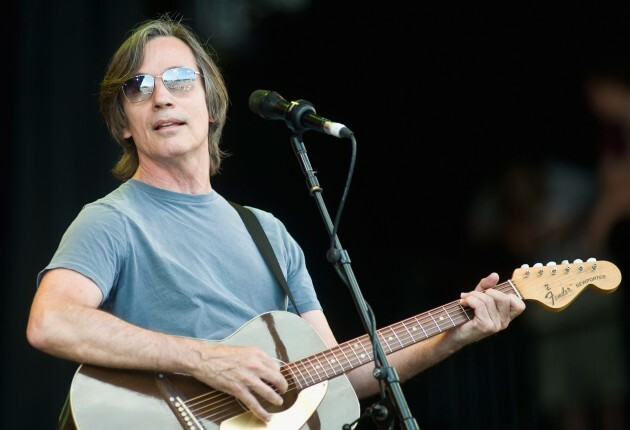 Jackson Browne is headlining a concert to publicize the plight of Leonard Peltier. 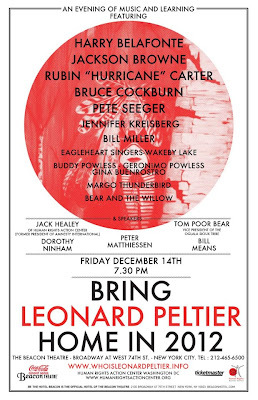 The show, called Bring Leonard Peltier Home, will take place December 14th at New York’s Beacon Theater. It will be hosted by Pete Seeger and Harry Belefonte, and feature a set by Bruce Cockburn. 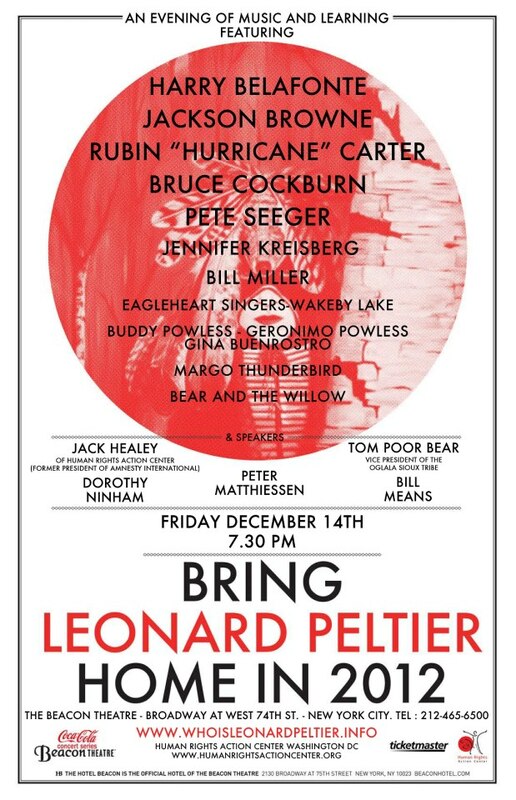 “Bring Leonard Peltier Home 2012 Concert,” presented by Metropolitan Talent and hosted by Pete Seeger, and Harry Belafonte at the Beacon Theater in NYC, Friday, December 14, 2012, at 7:30 PM . On Friday, December 14, 2012 a diverse group of people from the music community, in the United States and Canada, will gather at the Beacon Theater, in NYC to sing for freedom for a man who has been locked away since the tumultuous days of the early seventies and the violence at Wounded Knee and Oglala, South Dakota. Many around the world question whether he has received justice. Robert Redford’s film Incident at Oglala tells his story in documentary form. This concert is a cross-cultural event meant to bring awareness to the 37 year long ordeal of Native American Activist Leonard Peltier. Pete Seeger says it is the blessing he’s been waiting for. The chance to gather with those he’s invited to participate has been a long time coming. Joining forces with Civil Rights icon Harry Belafonte, the two have invited artists including Jackson Browne, Canadian Hall of Fame folk artist, Bruce Cockburn, Native American singers Bill Miller and Jennifer Kreisberg and others. This is a rare opportunity to gather with traditional Native American artists and singers, including an opening song by Wisconsin Oneida singers Buddy and Geronimo Powless and Gina Buenrostro. Then the Canadian Cree drum group Eagleheart Singers will join with Mashpee Wampanoag drum group, Wakeby Lake Singers to sing traditional honoring songs for Peltier. Both groups have been singing for Freedom for Peltier since the seventies, often together. Tuscarora Jennifer Kreisberg, has appeared on several movie soundtracks and has sung back up for Bonnie Raitt, Richie Havens and Jackson Browne, before embarking on a solo career in recent years. She was formerly a member of the group Ulala and, along with Mohican singer Bill Miller of Wisconsin is a regular in the Native American music world. Miller has toured with Pearl Jam, Richie Havens, Arlo Guthrie and others. These distinguished musicians have donated their time freely in hopes of bringing awareness to the Peltier cause for clemency. Special guest speakers will include noted American author Peter Matthiesson, who wrote In The Spirit Of Crazy Horse, the Peltier story, and “The Snow Leopard.” Rubin “Hurricane” Carter, the former Middleweight Boxer who is now an advocate for the wrongfully imprisoned and is traveling from Toronto to speak for Peltier, and former Amnesty International President, Jack Healey of Human Rights Action Center in Washington DC. will speak on Peltier and the many human rights violations in his case. . Tom Poor Bear, the Vice President of the Oglala Sioux tribe and Bill Means of the American Indian Movement will also discuss the Peltier case. The concert will open with a beautiful short film subject that includes Carlos Santana, and others who lend their support from a distance, followed by a song recorded by singing duo, Bear and the Willow. Indigenous activist Leonard Peltier, is an accomplished author and artist, also known for his humanitarian achievements from behind bars. In 2009, he was nominated for the Nobel Peace Prize for the sixth consecutive year. Mr. Peltier also has been awarded the Human Rights Commission of Spain International Human Rights Prize (1986); North Star Frederick Douglas Award (1993); Federation of Labour (Ontario, Canada) Humanist of the Year Award (2003); Silver Arrow Award for Lifetime Achievement (2004); First Red Nation Humanitarian Award (2009); Kwame Ture Lifetime Achievement Award (2010); Fighters for Justice Award (2010); and First International Human Rights Prize, Mario Benedetti Foundation (2011). Wrongly imprisoned since 1976, Leonard Peltier has been designated a political prisoner by Amnesty International. Nelson Mandela, Desmond Tutu, the late Mother Theresa, the Dalai Lama, 55 Members of Congress and others—including a Federal judge who sat as a member of the court in two of Peltier’s appeals—have all called for his immediate release. “Mr. Peltier’s human and constitutional rights have been violated many times.” Says Dorothy Ninham, of the Wisconsin Oneida Nation. She is one of the concert organizers, and President of the Board of the LPDOC . “We speak as much for him, as with him. Each step we take to New York is a prayer. Our prayers will be answered when President Obama commutes Leonard’s sentence. It’s time for Leonard to go home. We also hope all of those affected by the hurricane can recover and are safely returned to their homes as soon as possible.